Every so often, news of a mysterious creature at Loch Ness comes trickling out of Scotland. Usually these “Nessie” sightings come in the form of an odd blurry shape in the background of a tourist’s family photo, disappointing monster hunters everywhere when yet another floating hunk of twigs and lake kelp, or perhaps a runaway inflatable raft, is pulled from the deep. It’s not often, however, that irrefutable evidence of life in Loch Ness comes from a source as highly esteemed as the Massachusetts Institute of Technology. Nice article ! There is also a Giant Frog living at the bottom of our planet´s highest lake: Lake Titicaca in Bolivia, where I spent my vacations. They were also mistaken by "monsters" in many local legends. This frogs have really incredible adaptations to high pressure both because they live below 120 feet and also at 12,500 feet above sea level. I don't think that people could confuse an unusual toad with the Loch Ness Monster. First, the monster is supposed to be big - not the size of a toad. If it was no one would be talking about it. This find however, could be a sign of things to come. 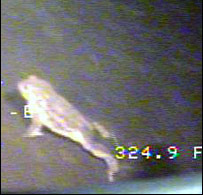 If this amazing toad was found why couldn't a giant monster be found later? There is no way that this finding will settle any of the controversy. It has been going on for too long to be ended by the finding of a toad. The 'believers' will not buy this explanation for what they have seen or heard. Uhhhhh the poster above me.....did you even read the article? The toad is NOT unusual. In fact the article states that it's a COMMON toad. What IS unsual is the fact that they found it living in water 324 FEET DEEP or the equalvalent of a 32 Storey building under water. That little bitty piece of info is NOT common to a common toad. Like to wish you every success in realising your idea elsewhere. Thank you for thinking of Tate Modern.